Oooooh, how I LOVE Simple Stories latest collection SN@P. I LOVE LOVE LOVE LOVE it. I literally LOVE everything about it. The bright colors, the playful patterns, the fun new additions (alpha packs and mini typeset packs and label packs) LOVE LOVE LOVE. I seriously can not verbalize how happy this collection makes me :) So instead I will show you the first layout I made with SN@P (that's right, SN@P is NOT just for Project Lifers, though it may be perfect for those folks too). I told the Simple Stories folks that I think they made this collection for ME. But from what I am hearing out on the street, it seems like it is making a lot of people very happy ;) So fun. Scrapping with this line is just plain fun. You can go check out all the details on the Simple Stories blog and see all the fun product included in SN@P. I would love to do a SN@P giveaway but right now I am hoarding every piece I can get my hands on lol. Maybe I will buy an extra collection kit to give away here so I dont feel so guilty about hoarding all I have lol! Absolutely love this! Awesome! The colours are so fabulous!! 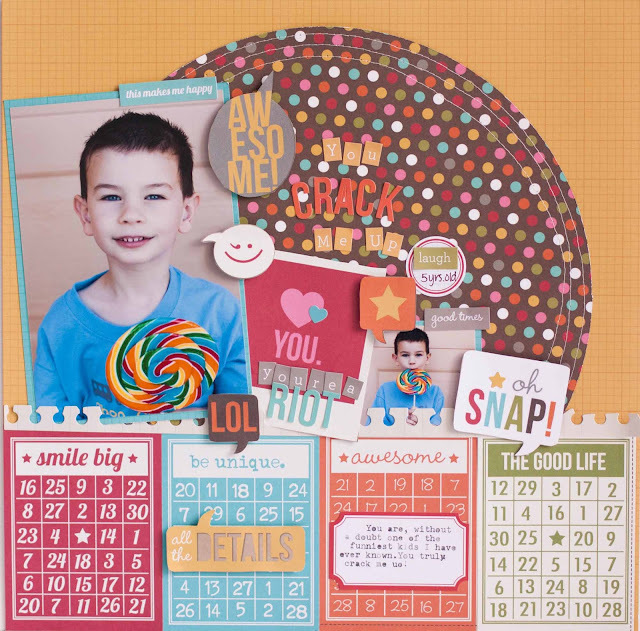 I love circles and lots of color so I love this layout! I am also loving the way you lined the bottom of the layout w/ those "Snap" cards! This is just way cool Rebecca I love how you have those bingo cards across the bottom! I love that large circle in the background--FANTASTIC! Such a fun page. Love those bingo cards and the photos with the big sucker. omg. soooooooooo cute!! love those speach bubbles and fun title.